Jalyn Radziminski-Smith (left) and Virginia Spinks will spend the next month immersed in the study of human and civil rights when they join a global network of students in Europe for the 2017 Humanity in Action Fellowship Program. Students interested in learning more about the Humanity in Action Fellowship and other prestigious awards should contact Megan Friddle in Emory's National Scholarships and Fellowships Program. Two Emory scholars will spend the next month immersed in the study of human and civil rights when they join a global network of students in Europe for the 2017 Humanity in Action Fellowship Program. 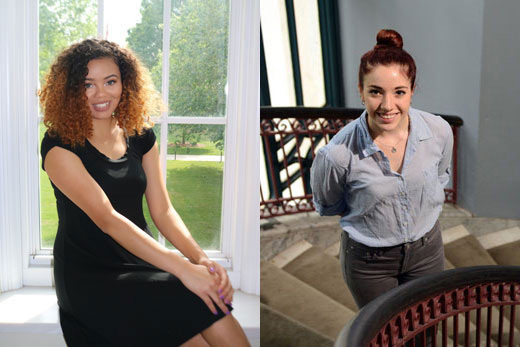 Jalyn Radziminski-Smith 18C and Virginia Spinks 17C were among 54 students and recent graduates selected for the fellowship program from among a competitive pool of more than 510 applicants from universities and colleges across the United States. They left this week to join fellows from Bosnia and Herzegovina, Denmark, Germany, Greece, the Netherlands, Poland and Ukraine to participate in the summer program. Humanity in Action (HIA) is an international non-profit educational organization created to educate, inspire and connect a global network of students, young professionals and established leaders committed to promoting human rights, diversity and active citizenship in their own communities and around the world. The goal of the interdisciplinary summer fellowship is to encourage future leaders to become engaged citizens and responsible decision makers through exploring the destructive social and political roots of prejudice, discrimination and dehumanization. Students are assigned to one of seven locations around the world. Radziminski-Smith will be based in Amsterdam, the Netherlands; Spinks will be in Sarajevo, Bosnia and Herzegovina. At the conclusion of the program, fellows will gather for a final conference in Berlin, Germany. HIA Fellows engage in daily lectures and discussions with renowned academics, journalists, politicians and activists and participate in site visits to government agencies, non-profit and community organizations, museums and memorials. The program aspires to highlight different models of action to remedy injustice through a global education experience. Following the month-long program, students will also complete a final research project of their choosing. For Radziminski-Smith, a member of Emory's 1915 Scholars Program that supports students who are the first in their family to attend college, being chosen for the HIA Fellowship is a dream come true. “I actually learned about it my first year at Emory and have been wanting this ever since then,” says Radziminski-Smith, a rising senior majoring in linguistics and interdisciplinary studies, with a research focus on human and civil rights. It was in high school in Fort Wayne, Indiana, that she felt the awakenings of a desire to contribute to the world around her. “I noticed different groups on campus were separate and not getting along and found myself thinking how I could help the community around me by bringing people together," she says. Through a program called Champions, she created an awareness campaign at her school to help Special Olympics athletes. At Emory, that desire to make a difference has flourished, she says. Through a post-high school program, she had an eye-opening experience as an international student ambassador in Japan following the Fukushima nuclear disaster. But it was a chance to visit the Baltimore neighborhood of Freddie Gray, who died in police custody, through an African American studies class at Emory that provided “a huge push” toward exploring civil and human rights. “Seeing all these issues play out on a domestic and international stage, I just knew I wanted to go head-first into it,” she says. Having pursued research into black and Asian identity and solidarity, as well as World War II genocide and war crimes, while at Emory, “I’m hoping to learn more about the effects of that in Europe this summer, how discrimination plays out in a country different from mine and to learn what I can do about it,” she says. As a rising senior, Radziminski-Smith plans to complete a senior thesis that examines the experience of the NAACP in Japan, with a traditional paper and an awareness campaign. “I’m hoping to use the skills I learn about human rights to take that issue to a global scale,” she says. For Spinks, a religion, anthropology and dance major who graduated with honors this month from Emory College of Arts and Sciences, the fellowship offers an opportunity to expand her scholarship into cultural anthropology and religion through an international lens before pursuing graduate studies. “I imagine I was assigned to Bosnia and Herzegovina because of the particular struggles there concerning integration,” she says. “This is a post-conflict, ethnically and religiously diverse country, now interrupted with the challenges of immigration — that’s a lot of disruption. “But I think it was probably my experience with those types of conversations that led to the program,” explains Spinks, who also studied Arabic for four years, studied abroad in Morocco and wrote her senior thesis on college student perceptions of Islam and terrorism. In fact, it was while going through the HIA application process that Spinks says she realized, “I essentially have been studying human rights at Emory through anthropology research and public scholarship and extra-curricular involvement with Campus Life, particularly Emory orientation programs. “You become very involved in conversations about difference, acceptance, identity, politics and integration — very similar conversations to human rights discourse,” she explains. “I feel like that’s the reason I applied,” she says. “On some level, I’ve always felt that I want to do human rights work, with scholarship that has a public aim.